Effects of soil erosion are numerous and can occur on- or off-site from the erosion source. Climate, particularly, rainfall is the primary driver of soil erosion by water. Rainfall is not only the main agent of detachment of soil particles but also the principal source of water running over the soil surface. The erosivity of the rainfall depends on the intensity and duration of a rainfall event as well as of the mass, diameter and velocity of the raindrops. In cold climate regions, however, freezing-thawing cycles can also play a key role in detachment, while snowmelt can be an important additional source of runoff. saturation overland flow - occurs when a soil’s water storage capacity has been exceeded. Soil properties strongly determine a soil’s infiltration and storage capacities and, thus how it responds to rainfall events. Low infiltration or storage capacities can result in excess overland flows causing soil erosion. Arguably, human activities have become the most important driver of soil erosion by water in modern times and places, especially those witnessing strong increases in population and/or rapid advances in slope- and landscape engineering capabilities, including inappropriate ploughing and soil compaction from heavy machinery. The table below lists key and/or proxy indicators for soil threats identified by the RECARE project. The table below lists key indicators, the purpose of the indicator and methods used for measuring soil erosion by water. Different measures are available to control soil erosion by water. The most appropriate measure to use is dependent on the local situation, but the key principle is maximisation of rainfall infiltration in soils in situ. Soil erosion by water can have an important impact on other soil threats especially on a decline in soil organic matter (SOM), flooding risk, and a decline in soil biodiversity. Physical heritage - from changes in the aspect of the landscape, particularly from gully erosion raw materials – providing for example use of sands accumulated in river beds for civil construction purposes. 2 Cerdan, O., Govers, G., Le Bissonnais, Y., et al., 2010. Rates and spatial variations of soil erosion in Europe: A study based on erosion plot data. Geomorphology 122, 167-177. 3 Kirkby, M.J., Jones, R.J.A., Irvine, B. et al. 2004. Pan-European Soil Erosion Risk Assessment: The PESERA Map, Version 1 October 2003. 5 Jones, A., Panagos, P., Barcelo, S. et al. 2012: The state of soil in Europe. EUR 25186 EN – Joint Research Centre. JRC Reference Reports, Publication Office of the European Union, Luxembourg, ISSN 1018-5593, 71 pp. 7 Stolte, J., Tesfai, M., Øygarden, L., Kværnø, S., Keizer, J., Verheijen, F., Panagos, P., Bilbao, C and Hessel, R., (2015). 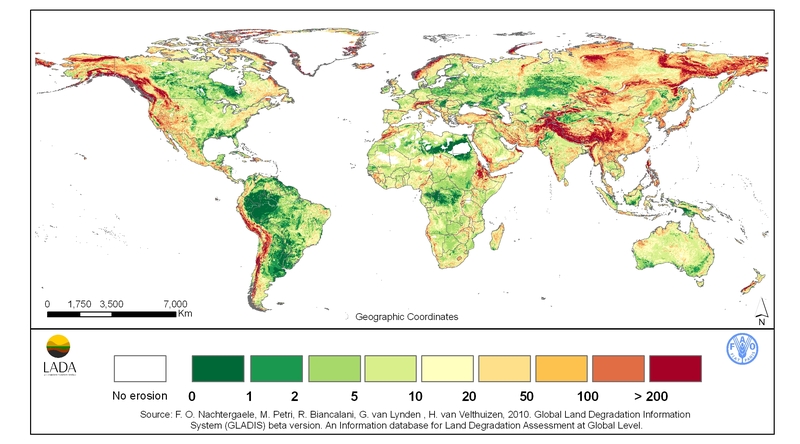 Soil threats in Europe. JRC Technical Report. 8 OECD, 2013. Soil. Water and wind erosion. In: OECD Compendium of Agri-environmental Indicators. OECD Publishing. http://dx.doi.org/10.1787/9789264186217-9-en..
9 Vanmaercke, M., Maetens, W., Poesen, J., et al., (2012). A comparison of measured catchment sediment yields with measured and predicted hillslope erosion rates in Europe. J. Soils Sediments 12(4), 586–602. A RECARE video link to a presentation explaining soil erosion can be viewed here.